An advanced water-based acrylic clear sealer that provides a high gloss protective and durable finish to paving stone and exposed aggregate surfaces. Clean Surface - Sweep all dirt and loose debris from surface. Remove all oil, grease and foreign materials. Surface must be completely dry before applying High Gloss Sealer. Applying High Gloss Sealer - Stir pail thoroughly. 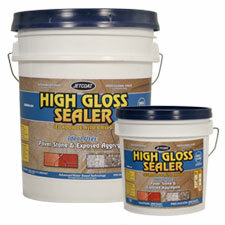 Apply thin even coats of sealer with a roller. Additional coats may be applied to achieve desired level of gloss and finish. Allow material to dry thoroughly between coats. Provides a high gloss protective and durable finish. 66815 4.75 gal. Pail 46 lbs. 66811 .9 gal. Pail 9 lbs.